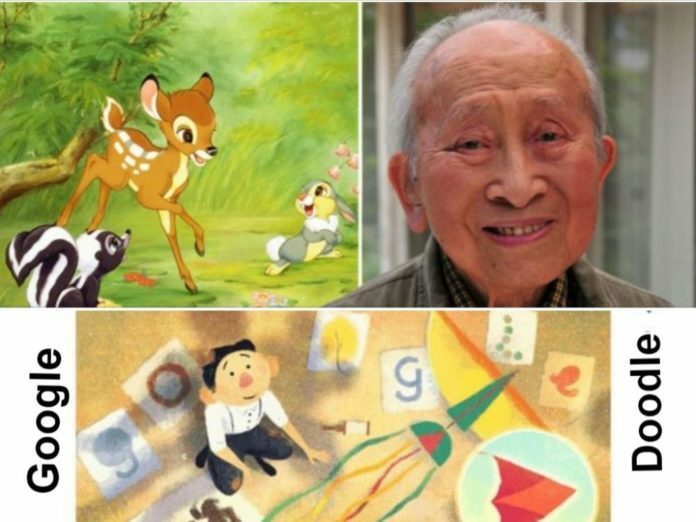 Chinese-American artist and illustrator Tyrus Wong is being recognised for his illustrious career with a Google Doodle on what would have been his 108th birthday. Wong, born as Wong Gen Yeo in the Guangdong Province, China on October 25 1910, immigrated to USA with his father when he was nine – which marked the last time he would see his mother and sister. Upon arriving in America, Wong faced hardship as he was barred entry under the Chinese Exclusion Act, which restricted the number of Chinese immigrants that could enter the country. He ended up settling in Los Angeles, California, where he began attending school. His teachers soon noticed his artistic capabilities and his talent led to a scholarship opportunity at the Otis Art Institute. After graduating, Wong became a talented animator, calligrapher, muralist, and set designer, setting out on a career in Hollywood during which he created some of Disney’s most iconic works, including ‘Bambi.’ However, his only credit came in the form of a background artist. He worked as a production assistant for 26 years at Disney and Warner Brothers Studios. Alongside, he continued to paint, with many of his works being displayed alongside works of Picasso and Matisse throughout his career. But it wasn’t until 2001 that Mr Wong was finally acknowledged for influence on ‘Bambi’, when Disney bestowed upon him the honour of a Disney Legend. Wong passed away in 2016 at the age of 106, by which time his talents and contributions to the art world were widely recognised.